A smooth, semi-gloss, anti corrosive coating, which can be applied direct to bare, previously painted or weathered metal surfaces providing a hardwearing finish. Approx coverage 10m2 per litre. Hazard Safety Codes: R10. 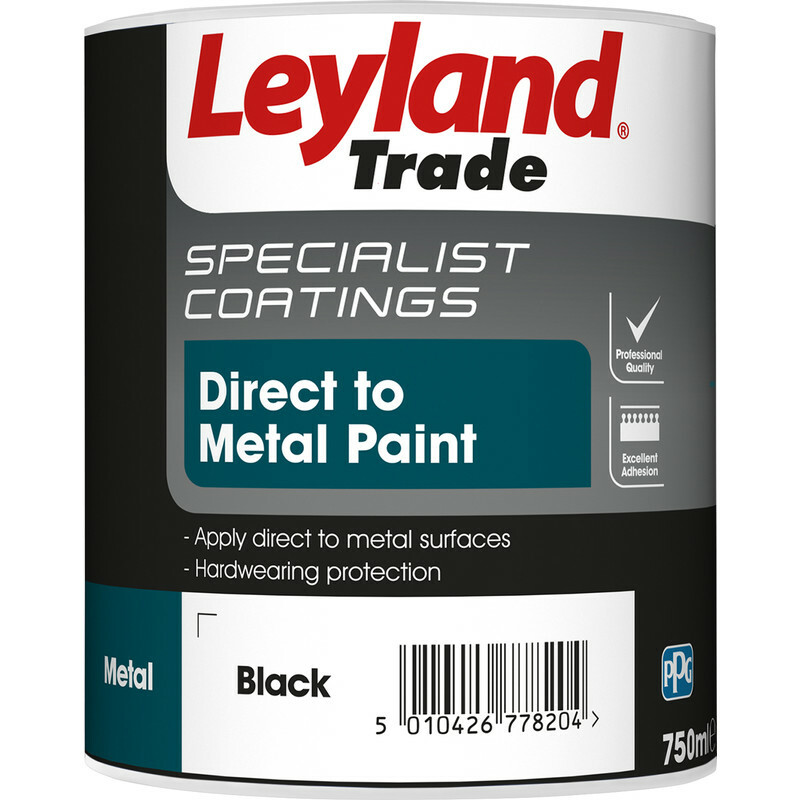 Leyland Trade Direct to Metal Paint 750ml Black is rated 3.5 out of 5 by 11. Rated 1 out of 5 by Aangry from Don't purchase I brought this to paint my garage door. Unfortunately it was like trying to paint with glue. It was very difficult to get the paint off the brush or roller. Know matter how thin you tried to spread the paint it ran, and dried so quickly you could not brush out the runs. My garage door looks a right mess. I now have to sand it down again, and re-paint with a better quality product. I have done a lot of different types of painting over the years, and I have never seen paint as bad as this. Rated 4 out of 5 by STEVE the second from Looks OK Paint applied by brush to access tower. It looks OK for what it is, but for this job, the drips and runs don't matter. Rated 5 out of 5 by Johnboy777 from Strong paint Used this on our tractor exhaust, brilliant!!!!! Rated 5 out of 5 by Bob on from Metal paint Bought a couple of days ago to paint some manhole covers on a new build. Drive was newly laud tarmac and grids red rusty. It was not the cheapest or the dearest. I went for a middle of the road. What a great choice. Goes a long way and the finish was even better than i imagined. Well pleased.